Launched in Vilnius on 6 April 2018, the virtual reality roadshow visited Bucharest, Berlin, Rome, Marseille and ending in Madrid on 29 July 2018. Visitors equiped with VR headsets which allow for a 360 degree virtual reality experience, were able to choose from three sceanarios. The first threw the visitor into a Rohingya refugee camp in Bangladesh, the second showed a civil protection exercise in Denmark and the final scenario allowed the viewer to take control of a water bomber flight in Italy. 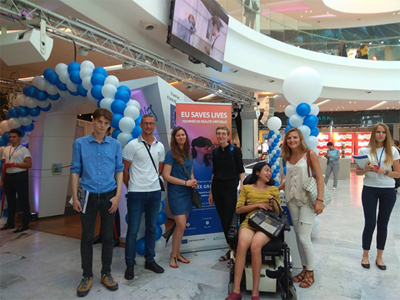 Through its participatory elements, #EUSavesLives sought to bring the EU closer to its citizens and to showcase how the EU makes a positive contribution to the everyday life of European citizens and those in need worldwide. Christos Stylianides later participated in a citizen’s consultation at Marseille’s World Trade Center, which was broadcast live via Facebook, to discuss the challenges Europe faces in greater depth. ← Citizens’ Consultations for the Europe of tomorrow – Allez-y!